Heat oven to 375°F. Turn 10-oz custard cup upside down on center of ungreased large cookie sheet. Remove dough from one can, keeping dough in one piece; do not unroll. With hands, roll dough to 12-inch log. Cut log into 20 slices. Arrange 16 slices, slightly overlapping, around custard cup. Repeat with second can of dough, cutting log into 20 slices. Arrange remaining 24 slices, slightly overlapping each other, next to but not overlapping first ring. Remove custard cup from center. Bake 13 to 16 minutes or until light golden brown. Gently loosen wreath from cookie sheet, and carefully slide onto cooling rack. Cool completely, about 30 minutes. Meanwhile, cook spinach as directed on package; cool and squeeze to drain. In medium bowl, stir sour cream, mayonnaise and milk until well mixed. Add spinach and remaining topping ingredients; mix well. Cover; refrigerate until serving time. Place cooled wreath on serving tray. 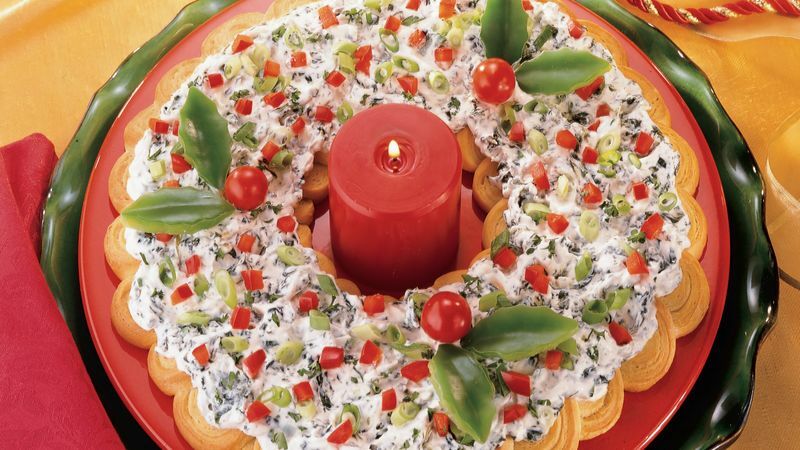 Spread wreath with spinach topping. Sprinkle with red bell pepper, 2 tablespoons onions and parsley. Decorate with bell pepper "holly leaves" and cherry tomato "berries." Serve immediately, or cover and refrigerate up to 2 hours before serving.